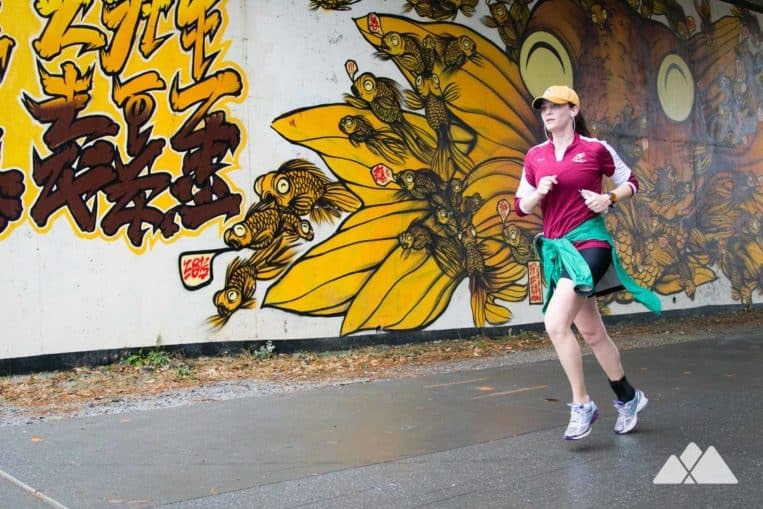 Run, walk or cycle the Atlanta BeltLine’s most popular stretch, the Eastside Trail, from Piedmont Park to Ponce City Market & Old Fourth Ward. The Atlanta BeltLine is a visionary project on a grand magnitude, aimed at transforming transportation and outdoor enjoyment in Atlanta. 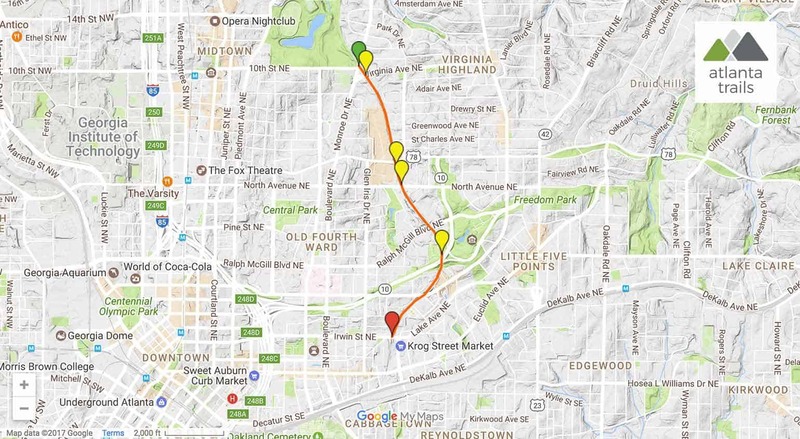 When completed, the project will produce a 33-mile, multi-use trail connecting 45 of Atlanta’s in-town neighborhoods along a former railroad corridor. 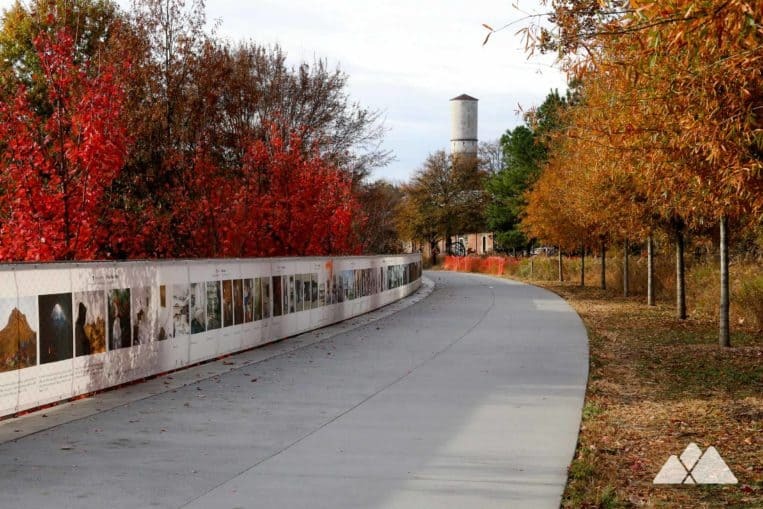 An effort over 13 years in the making, the Atlanta BeltLine has opened partial segments of the trail’s final epic distance. This run, bike or stroll explores a 2-mile paved section of the trail, the Eastside BeltLine Trail, which opened in 2013. The trail connects Atlanta’s Midtown, Old Fourth Ward and Inman Park neighborhoods, visiting the upscale redevelopment of Ponce City Market and passing a plethora of shopping and dining options along its well-loved path. 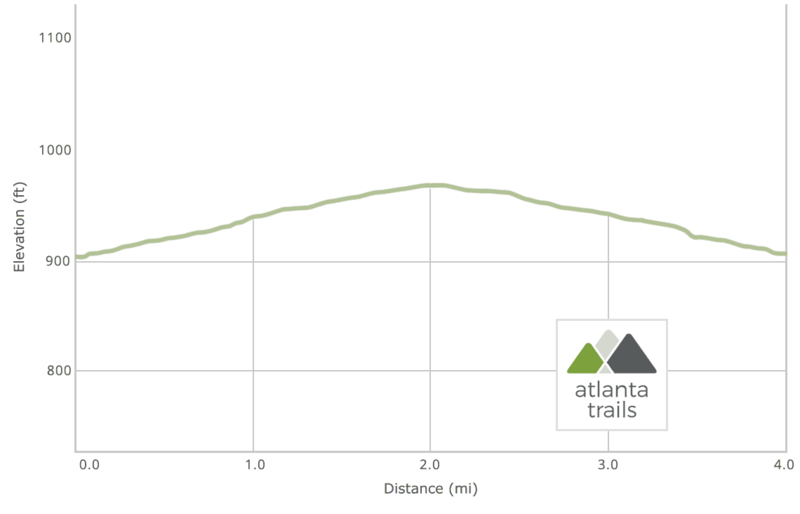 The Eastside BeltLine Trail is a level grade, wide swath of pavement that departs Midtown Atlanta at the southeast corner of Piedmont Park. Grab time on the trail on a fair-weather weekend, and the catalyst for the BeltLine’s positive intown buzz becomes quickly apparent: walkers, runners, cyclists, skaters, and strollers pack the trail, enjoying some sunshine, catching some cardio, or strolling to one of many BeltLine-side restaurants. Catch the trailhead at the intersection of 10th Street and Monroe Drive near Piedmont Park (view parking info, maps and driving directions). The paved Eastside Trail runs southeast, tunneling through an underpass beneath Virginia Avenue painted in vibrant murals. The Atlanta BeltLine is a celebration of community, culture, and history. 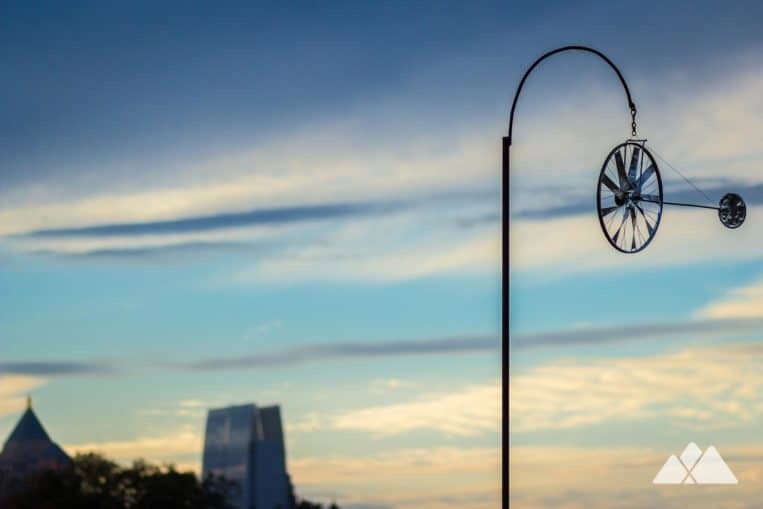 Work of local Atlanta artists and historic railway artifacts dot the trail’s pavement, and cycle with the seasons. The trail crosses Ponce de Leon Avenue via a bridge, making a trek between the historic Ford Factory and the massive, recently-opened redevelopment project, Ponce City Market. Make a mid-trail stop at Ponce City Market to grab a bite or a sip – there’s even a bike valet for those on two wheels. The Eastside Trail continues its southbound journey, crossing North Avenue and catching Atlanta skyline views from the North Avenue bridge. Entering Atlanta’s historic Old Fourth Ward neighborhood, the BeltLine passes the Old Fourth Ward Skatepark, a collection of enormous bowls, ramps, rails and half-pipes that are a stage for Atlanta’s skateboarding talent. Partially funded by the Tony Hawk Foundation and designed in collaboration with the local skate community, the park is Atlanta’s first public skatepark and, since opening in 2011, has been continually active. The park’s swath of green lawn is the venue for many events through the year, including the annual BeltLine Boil and occasional yoga events. The trail dives under the Highland Avenue bridge before approaching its paved end at Irwin Street, a 2-mile stretch from the Piedmont Park trailhead. Grab a bite or a drink at one of the nearby Inman Park restaurants before returning to Midtown, retracing your outbound steps to Piedmont Park. Have time and energy left? Take a run through Piedmont Park, exploring the park’s most scenic areas and catching some great skyline views. Paid parking is available at the Piedmont Park SAGE parking deck, or the lot beside Park Tavern at 10th Street and Monroe Drive.